BABINO, LENINGRAD REGION, RUSSIA–Today we visited an active quarry, which is a different experience from the riverbank exposures and abandoned quarries we have been frequenting. Quarry mud has a special character — a kind of purified mud, the kind of mud all mud aspires to be. There are also very large trucks splashing by, giant rock saws whining, cranes lifting large blocks, and small groups of curious workmen who want to see what we are doing there with our hammers that now seem so small. Active quarries can produce the very best exposures for geologists, especially those interested in the boundaries between rock units as we are. This quarry at Babino N60.03035°, E32.38613°) is particularly good because they quarry Ordovician limestone by first cutting it vertically, and then lifting the rocks away in sections, revealing smooth surfaces perpendicular to bedding. Cut surface through Ordovician section, Babino Quarry. I want most to see the boundary between the Lower and Middle Ordovician rocks, and look at the trace fossils above and below it. This boundary — a plane in the rocks which extends across northeastern Russia, Scandinavia, and parts of northern Europe — could not be better displayed than the way we saw it here. It is an erosional surface which has been cemented into a carbonate hardground and then bored (to some extent that we are debating) and abraded smooth. Above it is a significant change in the fossil fauna, a change which can be seen around the world. In no place is this boundary better presented to geologists than here. Lower/Middle Ordovician boundary in the Babino Quarry. The trace fossils along this boundary are complex and may show both boring and burrowing behavior. The distinction depends on when the sediments were soft, firm and cemented, and on the varieties of organisms which did the work. Borings in the Lower/Middle Ordovician boundary at Babino Quarry. I can’t take these specimens home for further examination. I’d very much like to make thin-sections (slices of rock shaved down until almost transparent for microscopic analysis) of all the critical intersections, but that will have to wait. Andrey collected many samples he can cut up and share from his lab in Moscow. 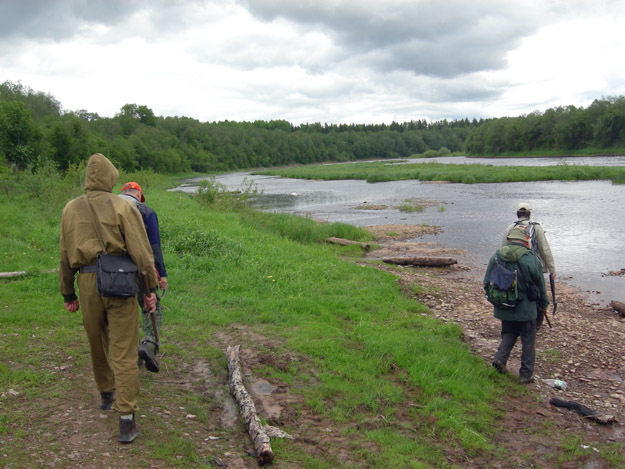 LENINGRAD REGION, RUSSIA–Before I describe the usual routine we have for this fieldwork, I should note that we are in the “Leningrad Region”, which is distinct from the “St. Petersburg Region” in a formal political sense. The Leningrad Region is essentially the rural portion of Russia outside the city of St. Petersburg. The people who live here voted to retain the name “Leningrad” after the dissolution of the Soviet Union. My colleagues say these people are “more conservative” and thus include many more communists than in St. Petersburg. Interesting use of the term “conservative”, I’d say. We rise from our finally-warm beds rather late for typical geological fieldwork, usually around 8:00 a.m. I’ve at last figured out why: the “white nights” mean we have usable sunlight until deep into the evening. We typically return to the field house at 8:00 p.m. and then begin the process of our dinner, which is usually ready by 10:00 p.m. Not quite my Wooster schedule, but I’ve adapted! We drive to our outcrops in a 1990s Russian version of a Fiat which, although lacking most of the modern conveniences, has heated seats! (It is the only place I’m truly warm.) The roads are poorly marked, so we spend a bit of time in orientation. Since the pavements on the secondary roads — if there is a pavement — is badly potholed, we move slowly. Most of our outcrops have been on riverbanks, so we stop on the top and then climb down a nearly vertical path (inevitably lined with stinging nettles and mosquitoes waiting for that outstretched hand) to the river itself. After a geological introduction from Andrey, we scatter and explore the cliff, meeting together in an hour or so to exchange observations. 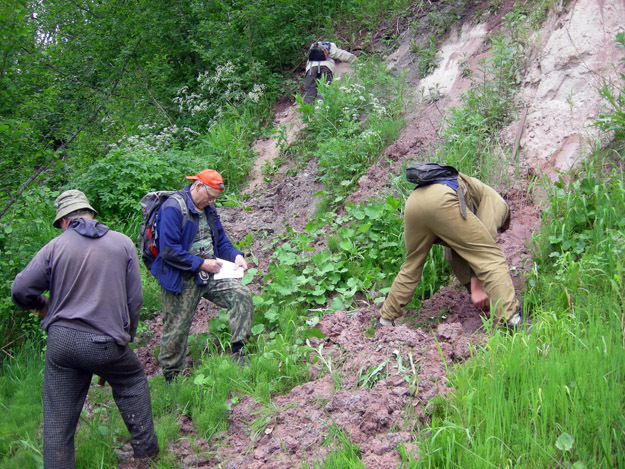 Andrey knows the stratigraphy precisely, with names for units as thin as a few centimeters which correlate for hundreds of kilometers. On our way to an outcrop of Ordovician rocks along the Syas River. Mud. Mud everywhere. Every slope is slick with it, and every outcrop has its roots in brown, sticky mud. I am overly concerned with it only because I have a fixed set of clothes and no laundry possibilities for at least another week. I desperately do not want to fall in it. We do all this, of course, because the rocks are fantastic, with each exposure a puzzle to be solved, and every piece you break off shows a sight no human has seen. Scientific and historical treasures await us every day. It is also the time our diverse team bonds over common goals and wonders. 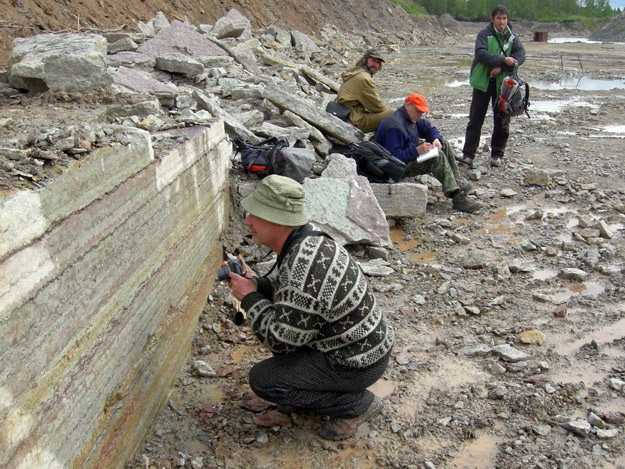 No language is needed when one geologist grins and shows another a particularly well-preserved fossil, or a sequence boundary stunning in its clarity. I have the best job ever.